IC 405 (also known as the Flaming Star Nebula, SH 2-229, or Caldwell 31) is an emission/reflection nebula in the constellation Auriga, surrounding the bluish star AE Aurigae. It surrounds the irregular variable star AE Aurigae and is located near the emission nebula IC 410, the open clusters M38 and M36, and the naked-eye K-class star Hassaleh. 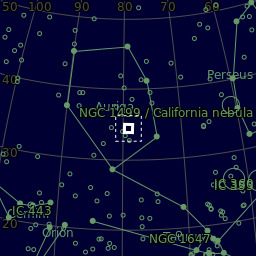 The nebula measures approximately 37.0' x 19.0', and lies about 1,500 light-years away. The nebula is about 5 light-years across.